Day Trippin’ | Sprezzatura, Y'all! 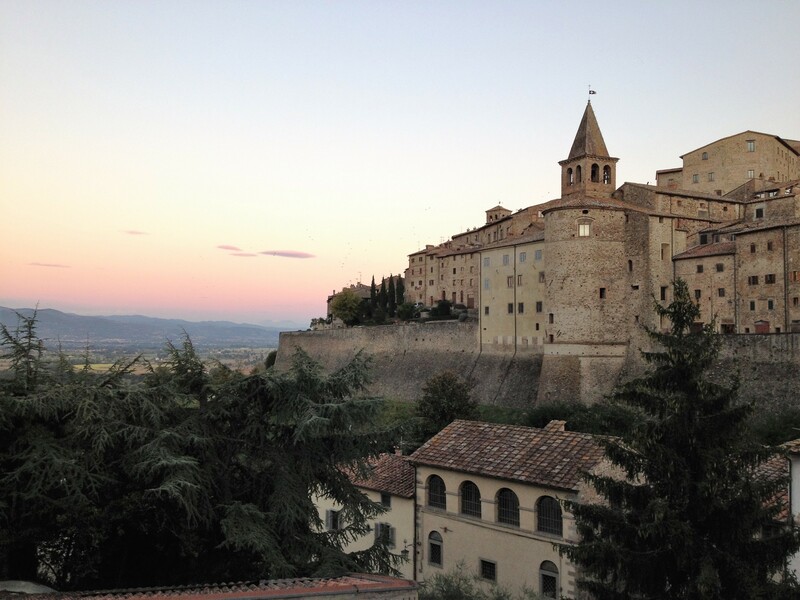 Our friends Judy and Jim from Atlanta recently bought and renovated an apartment in Spoleto. They just got back right before we left to come here and they gave us the keys and directions so Thursday we went for a visit. Spoleto is about an hour and a half from here and it’s a very easy drive. Easy in the sense that it’s almost entirely a four-lane road. Not so easy in the sense that it’s Italy. There’s perpetual road construction here. So you’ll be going along just fine and then all of a sudden the four-lane road becomes a two-lane road for a mile or so. And it goes that way pretty much the entire time. The lanes are a little narrow for my comfort level and the center barrier dividing the two directions is about three inches from your car when you’re in the left lane going really fast. Yikes. But when you don’t feel like you’re going to crash, the scenery is gorgeous. Anghiari is in Tuscany, which everyone knows. But it’s right on the border with Umbria, which is not as well known. It’s equally gorgeous, however, and one of my favorite regions. It’s called the green heart of Italy and it is. There are so many shades of green in this landscape. From the silvery green of the olive trees to the deep green of the cypress trees to the chartreuse green of the yellowing grape and tobacco leaves. This time of year is particularly beautiful because the olives are full and just about ready to be picked and the grapes and tobacco are being harvested. You also are beginning to see a little fall color on the trees. And the air is so crisp and clean, the days are bright and sunny with a deep blue sky that seems too vast to be real. Plan your trip to Italy for early October and you won’t be disappointed. Spoleto is much bigger than I thought it would be, so I’m very grateful that Jim and Judy gave us such detailed instructions, complete with pictures of every step of the way. 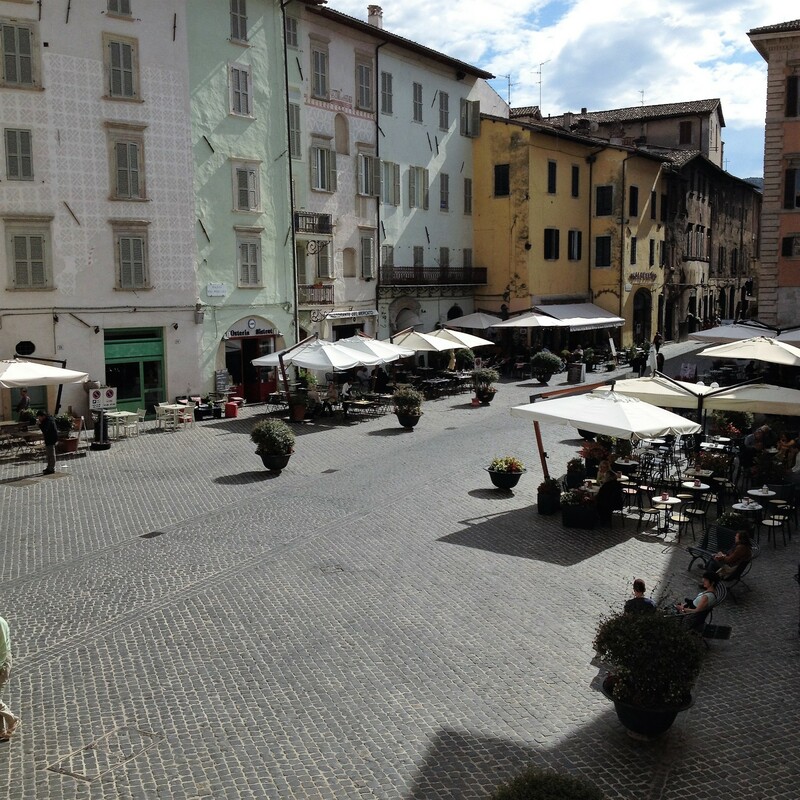 Their apartment is right off the Piazza Mercatale in the center of Spoleto. It’s a great location and the apartment is tiny but beautiful. They have done so much work on it and have made it really livable and functional. I could live there permanently, I think. Spoleto has lots of shops and restaurants – everything you need just outside your door. As luck would have it, we got there just in time for lunch. We went to Osteria e Enoteca on Judy’s recommendation. I had the strangozzi pasta with truffle sauce and Steve had the strangozzi pasta with a tomato sauce and truffles. Strangozzi is a pasta unique to the Spoleto area. Spoleto is no different from any other place – they have to have their own pasta that no one else has. How do they come up with so many unique shapes of pasta? My guess is many of the “unique” pastas are similar if not identical to other “unique” pastas. But I always try the one unique to the place we’re in. And so far I haven’t met a pasta I didn’t like. We also shared some grilled sausage and they were incredible. Something so simple, yet wonderful. I think it might be the best sausage I’ve ever had. After lunch we strolled around a little and had gelato, again on Judy’s recommendation. It was a place that had commendations on the wall about being the best gelato. Well, that’s the second place I’ve been to with the best gelato recognition. Not sure how they do that, but I do know that this was particularly good. And they had many varieties of pistachio, all made with different pistachios from different parts of Italy. Very good. On the way back home, we stopped in Montefalco to pick up some wine. They have some of the best wine – the Sagrantino. They also have one the best piazzas in Italy. Once back home we went to the sports bar for a drink, saw a few friends pass by and generally enjoyed life. We took a little stroll around town and saw the funniest sign. On the street we used to live on, there’s a little vegetable stand that has appeared. 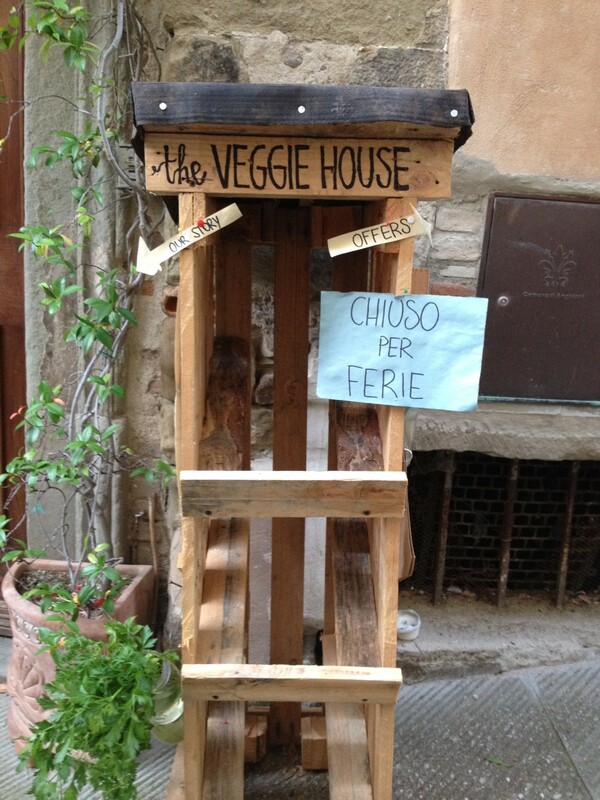 It has a sign in both English and Italian saying the owners are local Anghiarians who love fresh food and appreciate growing organically. They put their extra veggies in this little stand and you can take what you want, but not too much, and make a contribution if you want. They always have beautiful produce and if I still lived here I would go by there everyday to get something. I love this idea. Well, today they had a sign posted saying they were closed for vacation. How very Italian! We see this on shops and restaurants all the time. Now on the vegetable stand. Since we had such a big lunch, we decided to have a little meal at home of fruit, cheese, prosciutto and the Grechetto wine we bough in Montelfalco. I never get tired of this view at the end of our day. Even though it’s the same scene, it’s different everyday. And that’s one of the things I love about Italy.